North Atlantic Treaty Organization’s Task Force Human Factors and Medicine (HFM)-195 has just published the results of their deliberations on integrative medicine interventions for military personal. 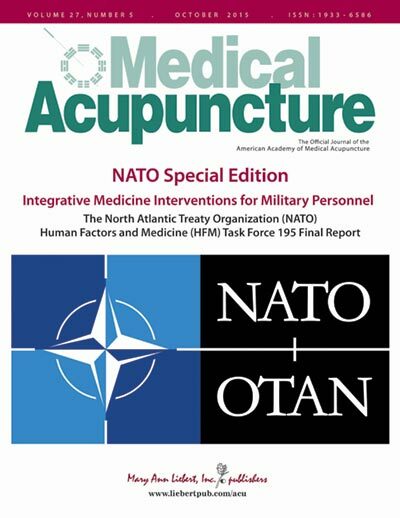 The findings were published as NATO Special Edition-Integrative Medicine Interventions for Military Personnel in the October 2015 issue of Medical Acupuncture, 27(5). The individual articles range from historical perspectives to analysis of clinical applications of CAM. The individual articles can be downloaded – free of charge – from http://online.liebertpub.com/toc/acu/27/5. To improve health care systems and increase available treatment options for patients. To identify and to evaluate the various countries’ data on the utilization (rationale, frequency, accessibility) of CAM among Military personnel. To learn about the acceptability of CAM by the leadership of Military organizations, and review briefly the current regulatory and legal status of CAM utilization and its implementation. To explore NATO-wide implementation of selected CAM modalities (e.g., acupuncture, meditation/mindfulness programs, movement/yoga, biofeedback), with ongoing analysis of efficacy, cost-effectiveness, suitability, and acceptability. To develop acceptable terminology, regulatory policies, and educational literature. To expand perspectives and understanding of cross cultural initiatives and research project. Look at the articles in the journal. It is a great resource. Thank you Erik!!! this is excellent!! !